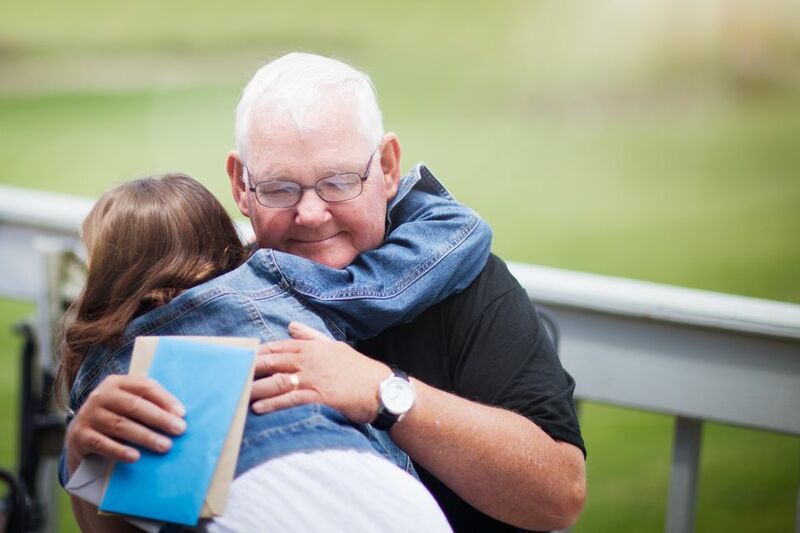 These free Grandparents Day cards are a wonderful way to let your grandparent know how much you love them. Whether you're looking for something funny or touching, you're sure to find the perfect card for the grandparent in your life. All of these Grandparents Day cards are free and can be quickly printed from your computer. Hand deliver them or put them in the mail to make sure your grandparents have an extra special Grandparents Day. If you have a little more time to devote to making a Grandparents Day card, consider making your own using a Grandparents Day poem. You can also find Grandparents Day freebies like coloring pages, crafting projects, and activities. This lovely Grandparent's Day card from 76th & Newbury can be given as a card for a printable that can be framed. The card says "A Garden of Love Grows In a Grandparent's Heart" and is available in blue, pink, green, and purple. 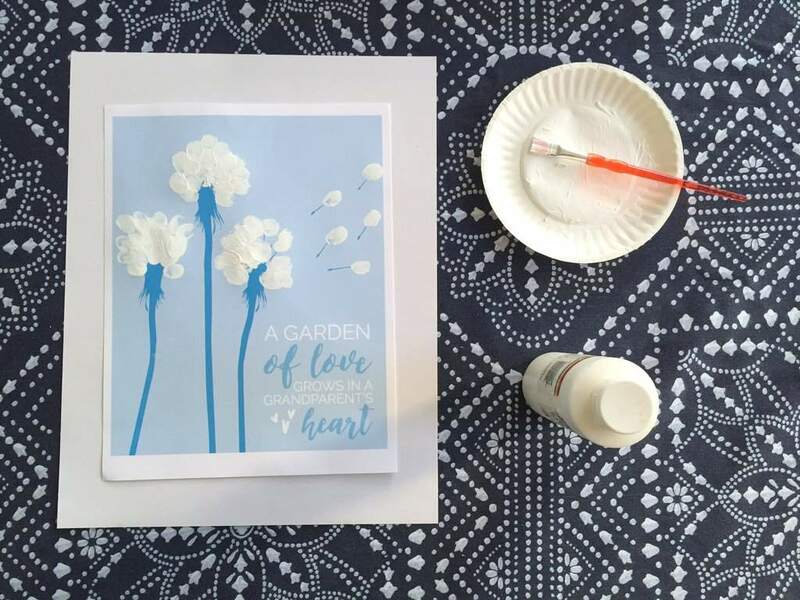 After printing out the card, have the grandchild use white craft paint to add their fingerprints to make the dandelion seeds. Highlights magazine has a free Grandparent's Day card that is packed full of sweet activities for the grandkids to do before handing over the card. There's a picture to color, a portrait to draw, and a fill-in-the-blank letter to fill out. It folds up easily and is ready to give as a quick gift that the grandparents are sure to love. Greetings Island has a free, printable Grandparent's Day card that features two photos on the front that's perfect for showcasing the grandkids or a special moment with their grandparents. It's a fun yellow and green floral design that anyone will love. You can customize this card with photos, text, different layouts, and stickers before printing. This card can be printed as a traditional card or mailed as an e-card. After you print out this Grandparent's Day card, the grandkids will get to fill it out with why they're grateful for their grandparent, what they like most about them, what their favorite memory of them is, and a drawing of the two of them. This card is so special that you could even frame it and give it as a gift. Grandparent's Day Thumbprint Cards at Who Arted? This is an adorable Grandparents Day card that only takes a little work on your party to make it a very special keepsake. Print off the card, add the grandkids' fingerprints, and then have them list the top five reasons they love their grandparents. Lee Hansen has a free Grandparents Day card that can be printed and then colored in by the grandkids. You can print this Grandparents Day card on regular printer paper or on cardstock. Here's a beautiful Grandparents Day card that has a place for you to include three photos as well as some custom text with the grandchildren names'. This is a .psd file so you'll need Adobe Photoshop, Photoshop Elements, or the free graphics program Gimp to open and edit this free Grandparents Day card. Cristina Marie has designed this simple but lovely Grandparents Day card that features blue text and a flower. The inside is left blank so you can personalize the card. This Grandparents Day card opens as a PDF which you can print, cut out, and then add your message to. Greeting Island has a free Grandparents Day card that's incredibly cute and features a grandma and a grandpa. You can fully customize this Grandparents Day card with your own text, pictures, and stamps.